ROME, Apr 28 2017 (IPS) - As part of efforts to move towards “climate-smart” agriculture, several countries have shared In a meeting in Rome new experiences on how to produce food in ways that help farmers cope with the impacts of climate change and to reduce greenhouse gas emissions in agriculture. The exchange took place at a special 26 April side-event during a session of the UN Food and Agriculture Organization— FAO’s executive Council. While countries are embarking on the implementation of the Nationally Determined Contributions –the actions nations are taking under the Paris Agreement– the event provided an opportunity to learn from countries that have championed climate-smart agriculture in different regions, FAO informed. Climate-smart agriculture is an approach aimed at transforming food systems. It involves pursuing sustainable productivity increases while implementing climate adaptation strategies and reducing greenhouse gas emissions where possible, to achieve food security in the face of increasing climate change. In Tanzania, the UN specialised body reports, estimated loss in the agriculture sector due to climate change is about 200 million dollars per year. To tackle this problem the government has brought the climate agenda in line with agriculture development and food security policies, and climate change considerations are now mainstreamed into national development planning and budget allocations, it added. Tanzania also intends to invest more in research on climate-smart agriculture to inform decision-making and involve private partners to catalyse additional investment in the sector. 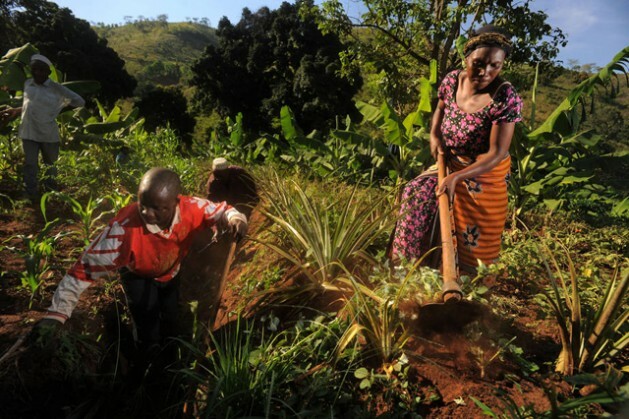 The national policy focus in Tanzania has hence shifted towards building resilience of agricultural and food production systems in the face of climate change and fostering adoption of climate smart agriculture, particularly among vulnerable, smallholder farmers, according to FAO. For example, rice-farming techniques that use less water were introduced several years ago in five Tanzanian regions –Morogoro, Iringa, Lake Zone, Shinyanga and Mbeya– are used now by around 30 per cent of all rice producers in those areas. The farmers have already seen their yields increase while using less water resources – which is particularly important for these drought-prone areas – and are eager to switch to new varieties of rice seeds. Conservation agriculture practices, implemented in the Lake Zone, have also shown their efficiency, the UN agency said. These have included the use of improved seed varieties of cassava, maize, sorghum and cotton, which are tolerant to droughts and water scarcity, and the use of organic fertilizers such as manure to increase soil fertility. As a result, the productivity in the areas practicing conservation agriculture has increased by about four times compared to the traditionally cultivated areas. National researchers have also developed special breeds of high-yielding dairy cows and introduced them to livestock farmers in the field enabling them to cut down the number of cattle while increasing their income. This in turn has helped reduce greenhouse gas emissions in livestock production and prevent grazing damage to crops. In Vietnam, about 700 000 hectares of rice and other food crops were heavily damaged by climate-induced natural disasters in 2016. As a result, rice production fell by 800 000 tons, and about 1.1 million people in affected areas were put at a greater risk of food insecurity. To reverse the dire situation, numerous climate change adaptation and disaster-risk management measures have been implemented at national, subnational and local levels. For example, rice cultivation area in several Central provinces has been converted to other crops such as fruit trees and grapes, which require less water for raising and can serve as an alternative source of income for farmers. When weather permits, the land can be easily switched back to rice production. On sloping land areas of Vietnam’s Northern mountainous regions and Central provinces, annual food crops are intercropped with forests, fruit or industrial trees, reported FAO. Such agro-forestry systems help farmers diversify their income, control soil erosion, and improve ecosystems and the environment. In addition, they help reduce greenhouse gas emissions and sequester carbon. Integrating crops or forests with aquaculture is also widely practiced in Vietnam. For example, the ecological shrimp-mangrove forests in the country’s coastal provinces provide sustainable livelihoods for vulnerable coastal communities while protecting natural resources. In household pig production, livestock farmers are being encouraged to use bio-digesters, which allow them to convert wastes into biogas used for daily cooking and lighting. They also create nutrient-rich slurry for fertilizing paddy rice fields. More than 35 000 bio-digesters have already been installed, which resulted in a 40 per cent reduction in greenhouse gas emissions. During the FAO-hosted event, the participants also highlighted the importance of embedding climate-smart agriculture in national policies and programmes, and promoting climate-smart practices in the field through trainings and farmer field schools in various ecological zones. They also stressed the need to provide accurate climate information to farmers, and investing in evidence-based research on climate-smart agriculture.